I remember playing video games (Ms. Pac Man, Donkey Kong, Centipede, Defender, Dragon’s Lair, Pole Position, Bag Man) at my local ice cream store when I was a kid. Summertime was spent as a 12 year old just hanging out. Not a lot to do in my new transplanted town, so…we’d scrounge up our loose change, buy cheap candy and play the vids. I still to this day have a huge warm spot in my heart for 80’s classic video games and WILL be buying a stand up classic video game at some point (I like the ones that let you play 20 or so different titles..for about $1500….not too bad…).Of course, I also have a place in my heart for the candy I ate in those days. And one of the biggees were “Nerds”, one of the Wonka candy company’s first offerings. (NOTE- I recently discovered that Wonka started making Nerds in place of Wacky Wafers, one of my all time favorite candies from when I was a little kid living in LA. This is kind of a massive bummer, as Wonka has no plans to fire up Wacky Wafers production any time soon. However, since I like Nerds, I’ll take what I can get).If my memory serves, the first box that came out was the strawberry with grape. It goes without saying that the design of the Nerds packaging was quite unique-dividing the box into 2 equal sides with individual slider openings on the top. This meant that you could eat only grape, or only strawberry, or…open both sliders and eat both. This was very cool. 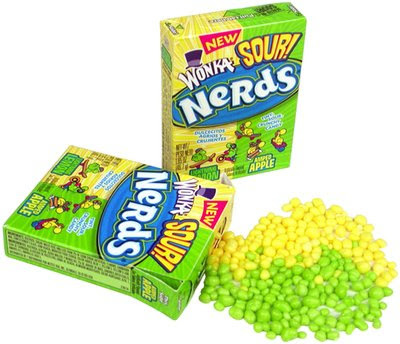 It meant you had to either pour the Nerds into your hands, or just pound them directly into your mouth-much more my style.Nerds are like tiny little pebbly shaped rocks. When you first throw them in your mouth, you get a pretty good representation of the flavor, and then, as they deteriorate, a nice mild sour flavor comes out. Overall, a really enjoyable candy experience for me over the last 25 years or so. Silly me. Not being a huge “idea” guy, I thought Nerds couldn’t get any better, but all of the sudden they have. Sour Nerds have 2 flavors: green apple and lemon. And just like normal Nerds, they’re shaped the same way, and have the same general taste effect upon first popping them in your mouth. However, after 30 seconds or so, the sour power starts to come out. And seriously-this is some pretty incredible sour flavor. This shouldn’t be lumped in with the Toxic Waste Gun sour level (review here) or Warheads (here)–this kind of sour is extremely sour, but it always is palatable. Not only that, it always keeps the flavor on the forefront of your mouth. So, even though you’re getting blasted with huge sour deliciousness, you’re also tasting the green apple flavor front and center (or lemon, of course). This is one of the key differences between “good” sour and “bad” sour. Nerds Sours really nail this one perfectly. I’ve had my stints of Nerds obsession- from the ice cream store playing vids, to buying a Halloween bag of individual sized Nerds boxes and inhaling all of them in 2 sittings, to sitting on the couch watching the SF Giants stay mediocre while chewing on Sour Nerds. And I gotta say that Sour Nerds are the best Nerds. For candy nerds like me, at least. Bottom Line: You gotta dig sour to enjoy these, but if you do, you HAVE to give them a chance. Don’t worry, you DO look stupid eating them, but who cares? wow. 9.5. I call those not only a ‘must buy,’ but also a ‘better have around.’ Nice can’t wait to buy. I was just about to review these and thought – ‘wait. I think Jonny did already’ – and lo and behold: Yes. How come it’s novel when a candy labeled as ‘sour’ IS actually sour? This antithetical from what reality should be. When you get a Twix bar and it says ‘chocolate’ on the wrapper, yr not surprised when you open it up and there’s chocolate all over the bar. It’s the given. It was on the goddamn wrapper. This is simple stuff – really. So here I am staring down the Wonka SOUR! Nerds and I’m wondering will these reallllllly be sour? Yes. Yes they are. Sour enough that they throw off the flavors a little. Using sour Over the flavors. I like. Definitely a re-buy.